The Spartans get 15 points from junior Lane Smith, along with solid bench play in road victory. Rivalry games matter just a bit more than others. Despite a slow start to the season for both the Hillsboro and Glencoe high schools boys basketball teams, the Spartans and the Crimson Tide coaches and players seemed a bit more ready to go for their crosstown rivalry game Tuesday, Dec. 18, at Glencoe High School. "We gutted it out," said Hillsboro head coach Mark Ganter. "We knew they were going to bring it because it's a crosstown rivalry, and we were fired-up too. There was some smack talk going on out there and that's fine, but my kids came out and they were ready to play." And they did strike fast. The Spartans jumped-out to a 6-0 lead on the backs of consecutive three-pointers by Logan Jackson and Lane Smith. Glencoe however, answered with five straight from junior Grayson Landon, including a three-pointer that pulled the Tide within one, 6-5, and from there the two teams traded blows leading to a 17-16 Hillsboro lead at the end of the first quarter. 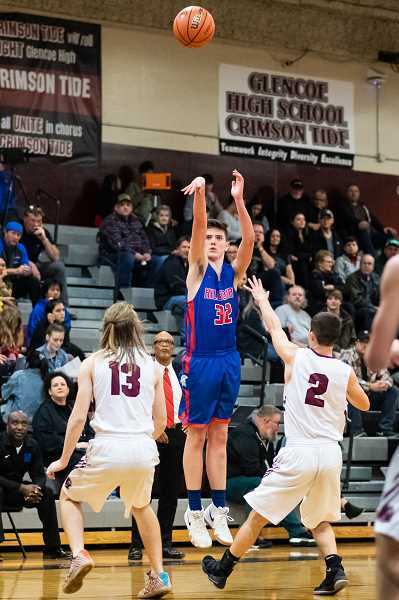 Hillsboro (3-4) was led early by Jacob Cooke who tallied six first quarter points, and Jackson, whose six total points came in the opening quarter, both of which were from behind the arc. Ganter said the 6-foot-4 forward can be a problem for opposing defenses, primarily due to his length and stroke from the outside. But he also said that how teams deal with him is something he's going to have to get used to and learn from going forward. "They ended up in a box-and-one on Logan (Jackson) because of his hot start," Ganter said. "They were trying to get in his head and we addressed that with him on the bench. We know he's going to be a target because he can shoot the lights out." Landon led all Glencoe scorers with 15 points, but the Tide did the bulk of their work through a balanced attack that saw four players score eight points or more. 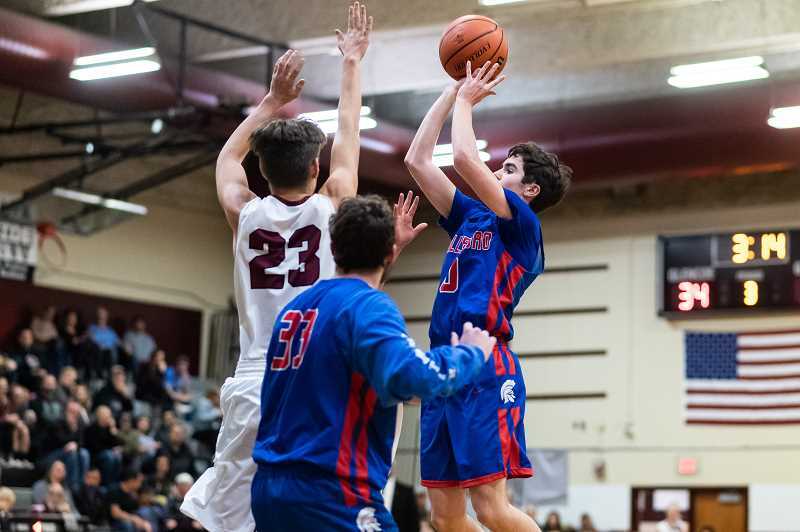 They used that attack in the second quarter to withstand and combat an early Hillsboro run, one that was spearheaded by Lane and Nate Smith, the former from the outside, the latter in the paint to help build a nine-point Spartan lead. Yet, Glencoe responded with seven of the game's next 12 points to close the gap to four, 31-27 at the half. Ganter attributed much of his team's early success to preparation, but also a level of intensity as a product of a defensive adjustment they made to start the game. "For once we came out and weren't flat to begin," said the coach. "We changed our defense a bit and it helped them come out with different intensity. We played a 1-3-1 zone and Glencoe seemed to have a problem figuring it out." Both teams struggled to score to open the half. Landon hit a three to almost immediately pull Glencoe within one, then the Tide took the lead shortly after when Michael Janeway scored to put the home team ahead 32-31. Hillsboro was hamstrung a bit by foul trouble early in the third quarter when Nate Smith was forced to the bench with four fouls, and additionally when starting point guard Kane Kiaunis joined him there after tweaking a lingering ankle injury. But while without two starters, the Spartans got nice contributions from Konnor McKinney, Dustin Rasmussen, and Vincent Felder Jr., who hit a big three to break a third quarter tie and give Hillsboro a 39-34 lead headed to the fourth. "No question our bench showed up tonight," Ganter said. "Vincent showed up tonight, Dustin hit a big shot, and Konnar gave us some good minutes tonight. That's the type of thing I'd like to see more from all our guys. They did a nice job." Glencoe (1-7) wasn't going to go quietly though. The Tide scored 10 of the final quarter's first 13 points and took a two point lead when Janeway hit a three to put them ahead 44-42, but Hilhi's Rasmussen answered with a three of his own, then the two teams see-sawed back and forth to tie the game 49-49 with 2:40 remaining. Felder hit a big three a minute later to put the Spartans up 52-49, then after a Dylan Walter free throw pulled Glencoe within two with 30 seconds left, Hillsboro's Lane Smith sealed the game with two free throws in the final 10 seconds to set off a joyous celebration for a Spartan team looking for the type of spark a rivalry win can often provide. "This win can mean a lot, primarily because of the way it finished," said Ganter. "I think 80 percent of our league games will look something like this, so for them to play this way in a close game and come out with a win, I think we can build on this and hopefully in January this will help us." Hillsboro will host Banks Friday, Dec. 21, at 7:00 p.m.
Glencoe will next travel to Redmond to play the Panthers, Friday, Dec. 21, at 6:30 p.m.